GVL / Emily Frye Darryl Shongedza serves a customer at the campus dining Lobby Shop wearing his name tag on Sunday November 19, 2017. 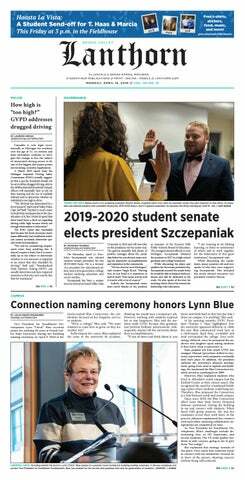 Sue Korzinek, the associate vice president and chief information officer for information technology at GVSU, said the university has been pushing for a preferred-name option for more than 10 years and that it will benefit many people at the university. Korzinek pointed out that some faculty members may opt to go by their maiden name, for example, because that is how they are recognized in the professional world. Or, they may want to keep their personal lives separate from their professional lives. With the preferred-name option, GVSU will also give transgender students the opportunity to express their gender identity without having to change their legal name. Jen Hsu-Bishop, director of the Milton E. Ford LGBT Resource Center at GVSU, believes the preferred-name option will make the GVSU community more inclusive. Once students request a preferred name on Banner, it will show up on most GVSU locations, including Blackboard, housing, student IDs, email, people finder and EAB student success collaborative. A legal name would still show up on other documents, such as accounting and taxes, admissions, employment, federal requirements, healthcare benefits and official transcripts. Not only does the preferred name need to be applied to different departments across campus, but each request will go through a screening process to make sure the name isn’t inappropriate. Simpler preferred name requests will go through the system more quickly, while less common changes will take a little longer. “For example, my name is Susan, and if I go into the system in February and put Sue in that preferred first name, there’s a table that it’s going to look at that says, ‘(Here are) all the nicknames for the legal name Susan,'" Korzinek said. "My name would pass through easily and would be approved that day. One important aspect of the screening process, Korzinek explained, is that it will prevent people from assuming the identity of another person. Korzinek emphasized that the screening process isn’t meant to control how people refer to themselves, but there will be limits to prevent it from getting too out of hand. With all of those factors considered, the preferred-name option is fairly flexible. People could use their last name as their first name or be playful with their name changes. While people will be able to be playful with their name changes, Korzinek cautions them from getting too carried away with changing their name. Future employers might have access to their preferred name at GVSU, especially through public tools, such as people finder.